With relief efforts underway, many displaced Haitians and their friends and families around the world are deeply concerned about the safety and whereabouts of loved ones. In response to the Haitian earthquake, a team of Googlers worked with the U.S. Department of State to create an online People Finder gadget so that people can submit information about missing persons and to search the database. You'll find this gadget on our Haiti earthquake response website as well as on the State Department website. In order to prevent the proliferation of multiple missing persons databases (a big problem during Hurricane Katrina), we've made the People Finder gadget standards-based and easily embeddable on any website (see here for instructions). The gadget is currently available in English, French and Creole. We're also helping families in the U.S. stay connected with their loved ones in Haiti by offering free calls to Haiti for the next two weeks via Google Voice. If you don't have a Google Voice account already, request an invitation at www.google.com/voice. For anyone interested in viewing updated imagery in Google Earth, we've now included GeoEye's shots from Wednesday in the Historical Imagery feature. 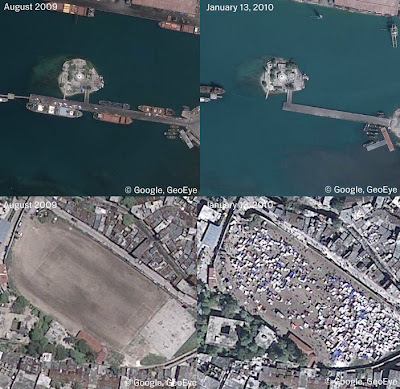 Now you can view the imagery without downloading the KML file and can use the time slider to easily compare the stark before-and-after images, such as those below. To help relief organizations, GeoEye has made professional-quality files of their recent satellite imagery of Haiti downloadable via our earthquake response website. We hope the imagery in this format will be valuable to GIS organizations and aid workers. We have also made Haiti Map Maker data publicly available for download for non-commercial use and attribution. Data can be used by relief workers to do things such as create offline maps, combine data sets and run analysis, all of which we hope will help with their efforts on the ground. Please help improve Haiti maps with Google Map Maker. News and user footage continues to roll into YouTube. Oxfam and the American Red Cross are even responding to donations by uploading videos that show viewers exactly where their contributions are making a difference.